The last quarter of the 19th century saw the Isle of Man develop as a destination for mass tourism as workers in the north of England took advantage of the growing practice of Wakes week holidays. As the trend for seaside holidays developed, the Island moved from being a ‘health resort’ for gentlemen visitors into one with mass appeal. The number of visitors grew from a rather modest 90,000 visitors per year in 1873 to a peak of over 663,000 in 1913. Despite a fall during the wartime periods, a respectable figure was maintained well into the 1970s. With a resident population in the low to mid 50,000s between 1881 and 1911, this influx resulted in a building boom with the need for new accommodation and entertainment venues as well as the associated infrastructure – rail links in particular. The Isle of Man became established on the circuit of seaside tourist destinations within the British Isles, at its peak rivalling Blackpool and Scarborough. To entertain the masses, large dance halls in Douglas had daily performances for anything up to 6,000 people at a time. Brothers Harry and Haydn Wood filled the demand for tourist music; many of the music hall songs of the period are now closely associated with the identity of the Isle of Man. Venues included: Falcon Cliff Hotel, Derby Castle, Palace Ballroom, Douglas Head and Feldman’s Song Halls, which were free to get in, and where you could buy blue booklets of lyrics to the latest songs. 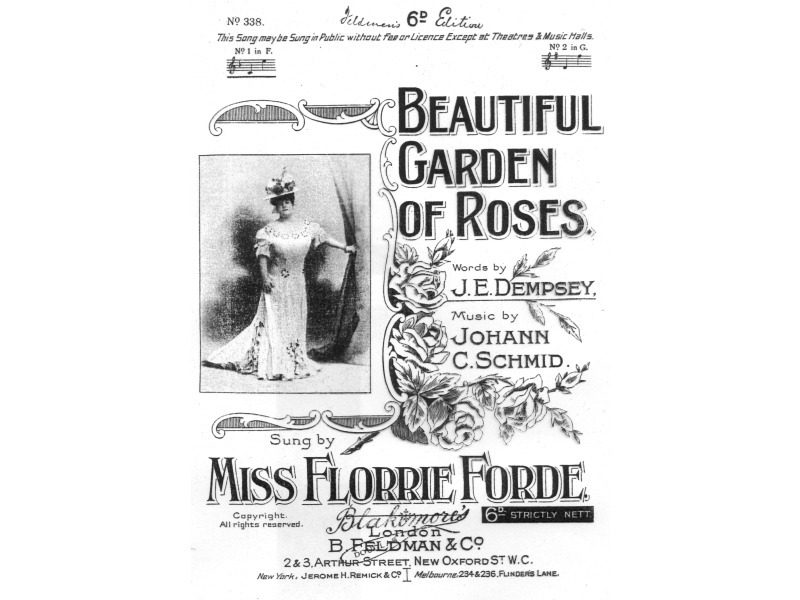 Before 1914 there were many famous music hall stars on the Island such as Florrie Forde, Hetty King and Vesta Tilley, all performing regular shows in the Derby Castle and the Palace Ballroom. At the Palace there was also a sacred concert with items from opera and oratorio on a Sunday. Dancing was predominantly to European composers such as Waldteufel and Strauss. A number of local composers responded to the influx of visitors by writing dance tunes and songs that were performed in the local amusements. The craze for songs about ‘Kelly’ was started by Oliver Gaggs, dance band leader at the Falcon Cliff Hotel: ‘Kelly the Carman’, ‘Has Anybody Here Seen Kelly?’ and other Kelly titles were hits both on and off the Island, words being re-written to fit other locations. After 1919 the music became livelier, due in no small way to the rise of America’s Tin Pan Alley and the spread of music through improvements to both the cinema and gramophone and, most importantly of all, the development of the radio. Music became more cosmopolitan, and also Americanised. Britain’s home-grown composers responded with what we now know as ‘light music’. 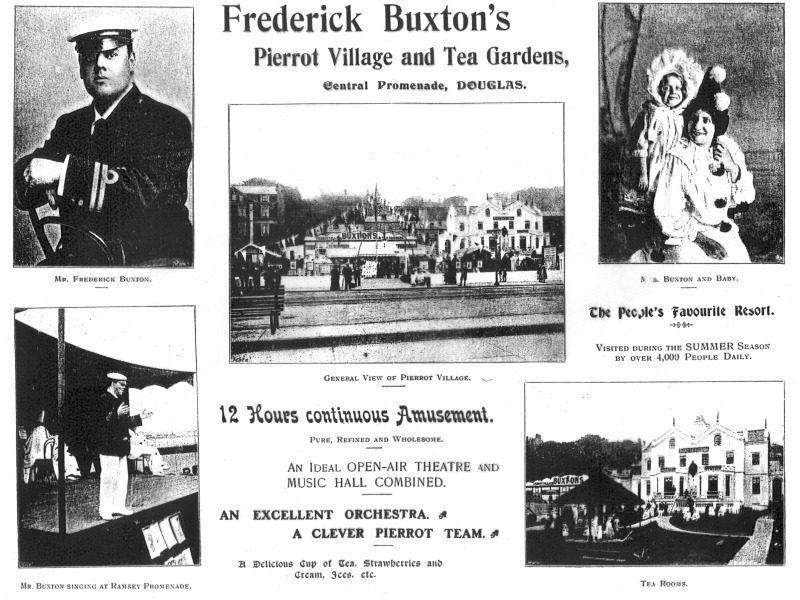 It was no mean feat that the musical director of the Palace and Derby Castle, one Harry Wood, kept his patrons entertained with a repertoire that was contemporary, and which not only included pieces by himself, but also his brother Haydn who later became a doyen of British light music. The phenomenal success of Harry Woods’ orchestras are now largely forgotten, but as a testament to his genius some 3,500 works can be found today in music libraries, many bearing Manx titles - a tribute to the fact that he became an adopted Manxman.